(*Only former Trooper event participants will be eligible) 12-23-04 Ala-Amateur Showdown! in Cullman ... 1st place trophy or certificate! Free entry fee! 9-29-04 Trooper Singles/ Congratulations Dustin Aker! 12-22-04 $100 Trooper "Bad Boy" Showdown! During the recent Trooper "Bad Boy" of Huntsville, ten players entered the "DYP" portion of the event which eventually pitted Robert Owen & James Porter against Dustin Aker & John Smith for the finals. Dustin & John came from the losers side of the chart and immediately claimed a win of the 1st match of the final in dominant fashion. But eventually, James & Robert prevailed in a close contest of the deciding match to earn the "DYP" win. During the "BYP" portion of the tournament, four teams battled it out including Randy Parker & Dustin Wisener defeating James Porter & Robert Owen for the eventual win. Finally, during the eight player "singles" portion of the tournament, Randy Parker would claim 1st place after defeating Dustin Aker in the final. James Porter finished 3rd place. 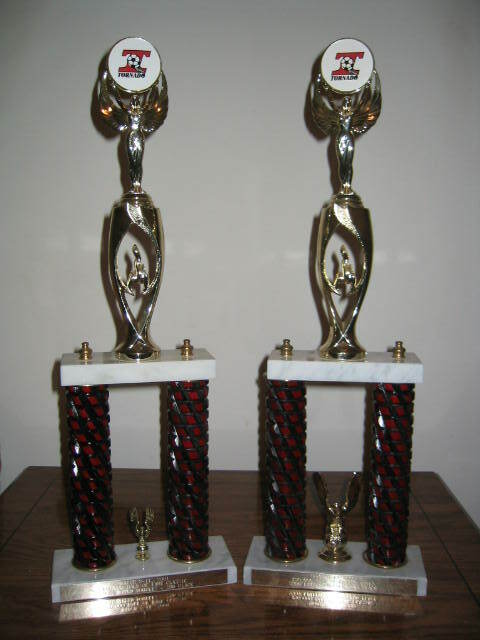 A points race was calculated during the three events in order to determine who was most deserving to be named "the most outstanding player", or Trooper "Bad Boy". Since Randy Parker won two events and while James Porter, Robert Owen, and Dustin Wisener, all only having earned one event wins, you'd think that Randy would win the "Bad Boy" title hands down. However, since Randy had went out in two games straight during the "DYP" it left the door open. When all race-points were eventually calculated, it turned out that Randy Parker and James Porter were tied. The two then played a "best of 3 game" match of singles play as tie-break. During the match, it appeared that Randy would eventually win the playoff due to his continued solid performance, especially shooting percentage. He won the 1st game easily, and seemed to have the momentum in his advantage for the second game as well, at least until James Porter was able to muster a gutty performance of his own. James was able to eventually turn things around after he fought back to game-ball of the 2nd game. During a time-out called by Randy with the ball on his 3-bar for a match point attempt, James desparately exclaimed, "I need to block a shot!". The spectators agreed, and with that said and possibly a slight adjustment in the defensive technique, James got that needed block and then went on to immediately score the game-ball point from his goalie position to force a 3rd game contest. James suddenly had the momentum in his favor and went on to win the deciding game and the title: Trooper "Bad Boy" for Huntville. A unique photo was captured on this day during tournament action in Huntsville (probably included atop this page). During a draw-your-partner tournament match, four veteran foosball players of the Huntsville area are pictured involved in a very intense match of possible rivalry proportion where the winners have the chance to earn $140 cash. Pictured is Robert Owen & Dale Oberhausen squared-off against Steve Roberts & Phillip Cantrell--Robert & Dale squeek out the victory. Steve Roberts, known in the day as "Goldie" and once considered probably the top player of the Huntsville area, now resides in Florida and is only visiting family and friends in Huntsville for the upcoming Thanksgiving holiday. Steve still plays foosball and has lived in Florida for the past nine years. The Alabama State Championships of foosball was a blast! The host, Holiday Inn Express of Cullman, turned out to be an awesome place for the championship tournament where 55 players battled it out for the $7,000 worth of cash and prizes and, most importantly, the 2004 state titles. This invites all interested persons to take part in the 17th Annual Alabama State Championships of foosball with "professional" and "amateur" events to be presented throughout the weekend beginning at 7pm on Friday November 5th. Special Alabama amateur events are scheduled for 9am on Saturday while the main event, open doubles competition, is scheduled for 8pm. While the "Ala-Amateur Showdown" is restricted to local players of limited, or no, tournament experience, the main event will feature professional and semi-professional players and teams competing from throughout the Southeast. Many other specialty events will be conducted throughout the weekend where probably at least 100 players will keep possibly 10 new foosball tables continually busy. For the first time since 1994, this year the tournament will be presented in Cullman, Alabama using the facility at the "Holiday Inn Express" which is located at the intersection of I-65 and Hwy. 157 (Exit 310). All are welcome and invited to witness and/or participate in the action, it promises to be the best ever! Additional information is included on the tournament flyer. Congratulations to Dustin Aker, an amateur player from Cullman, who recently captured the hardware awarded after winning the "Trooper Singles" tournament for Huntsville. Dustin is a fairly new player to the scene having bought his home model foosball table roughly a year ago and then soon after becoming an occasional participant of the tournaments in Huntsville. 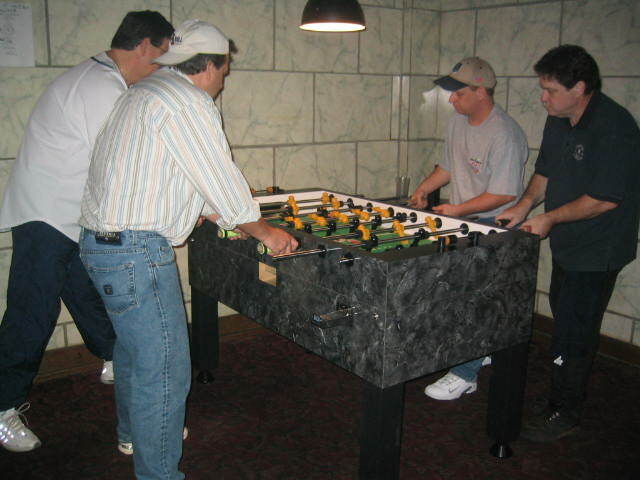 Foosball is a unique game and sport to many, a sport of which is known for a quite huge learning curve. First place in foosball tournament competition is almost always dominated by those of the most experience in competition. That's why it's quite an accomplishment, deserving our applaus, for Dustin earning this tournanment win, especially against the long-time veterans and semi-pro players of the area. Need I say?, watch out for Dustin Aker! An air of excitement permeated the Billiard Street Cafe in Huntsville,AL. as another installment of "Trooper Doubles" pulled players thoughts away from Hurricane Ivan's impending arrival. Old hands and new faces threw down on two fine Tornado tables to compete for hardware, honor, and two weeks of glory--'cause the next Trooper event happens on 9/29/04! Retired tour player Steve Perry dusted off his 3-rod push to fluster all opponents, while Atlanta's Buddy Maughon showed up the goalies. They did not lose a match! Steadily improving Dustin Aker teamed with Phil Cantrell at goal for second place. James Porter and John Smith had gritted teeth as John's shot ricochetted back into his own goal stopping them in a close third. David Burnett teamed with longtime friend Garrett Peterson to take fourth. 5th/6th placers were last T'Dubs winners Robert Owen / Bill Hartsell while new comers Clint May and Nick Peterson partnered together. Nice to see all come out! The Southern Foosball Program's "Trooper Doubles" drew in four brave teams despite a stormy night in Huntsville. Super goalie Bill Hartsell teamed with veteran forward Robert Owen to claim all matches and the coveted trophies; albeit using a tenacious scratch and claw offense! Narrowly missing the July title were runner-ups James Porter and John Smith, who are no doubt drafting a plan to reclaim bragging rights at the next Trooper Dubs. Ryan McGowan and David Burnett tasted meatnut heartbreak to manage third place with father / son duo Mike and Brad Hudson, respectively, rounding out the field. Kudos to all that attended, and understandingly, those that could not by reason of rough weather, we will see you next time! James/ Ryan won all matches to win $40 each while Robert/ Bill took 2nd. Phil/ John was 3rd. Two guys from San Antonio came in last night, Charlie Switzer and Nick Rodriguez. They were traveling around the area searching for foos action after finding information about our Huntsville foosball Program on the web. They left for Nashville soon after competing here in Huntsville. Roberto Padron who works out at the airport showed up to play pick-up games. He had to get up early, so he didn't enter the tourney. So, the tournament scheduled for next Wed. night is a bring your partner event for trophies while the entry fee is $3 per player. No pro players or AAA players will be eligible to compete. The local foos scene in Huntsville has been very slow for quite some time now. Local player Robert Owen is putting forth his effort to re-energize the weekly foosball tournament if possible, last Wednesday he called several players out to play and had a fair showing which was enough to conduct a tournament. He hopes players will continue to come out and participate. Lately, there has been a few visiting, as well as, new players stop by and peer in on the foosball action. We hope these players continue to come out and that they continue, or eventually, get involved with the foos-action. Phil Cantrell will be the weekly tournament coordinator--get there early for the singles warmup session. A special event is scheduled for Wednesday night prior to Thanksgiving Day which involves a bring your partner format competing for 1st place trophies. The participation is limited to non-professional players of the Southern Foosball Program. The Program is planning a series of similar events for 2004 and will refer to this group of players as it's "Trooper Group". This particular event is listed above in the special events area. I just added this "News & Announcements" section to this page where special information about the local foos-action in Alabama can be included in the future. Direct your questions or comments to the Southern Foosball Program/Rodney Jenkins at (256) 734-6349, or by email: jenkins@hiwaay.net.